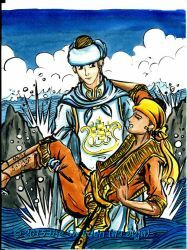 King Tabin walks to another cliff, and he hears the sound of the baby, so he wants to climb up to the cliff and get the baby. Before this part of interactive element begin, the user will be asked if they want to use microphone or keyboard. For the case of keyboard, the hint is at the button of the decision. 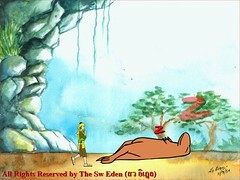 It shows the picture that the user must use the right arrow. The right arrow will push the giant bird away to the right hand side. For the case of microphone, the loud voice will push the giant bird in the same way. What will happen if we cannot save King Tabin from the giant bird? 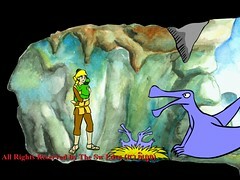 The giant bird will take him and drop him down to the floor, and the “try again” button will pop up. 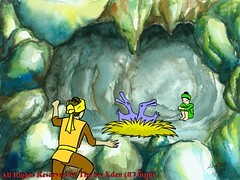 When King Tabin arrives the tunnel where the baby is, he walks to the baby and hold him into his arm, but the giant bird just comes at the exit of the tunnel. Again! the user needs to choose the keyboard option or microphone option. For the case of keyboard, the user just presses the down button and the stone on top of the tunnel will fall down on the giant bird. For the case of Microphone, now it is more interesting than the case of keyboard. 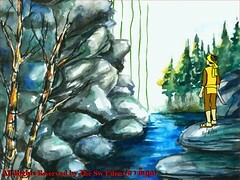 The voice must be loud enough to bring the stone down, but while the voice is not loud enough, the user will see the stone changing to scale in Y direction. 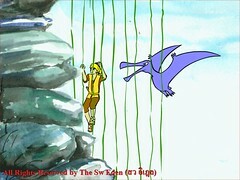 When the giant bird is knocked down, King Tabin will jump out from the tunnel and take the vine. 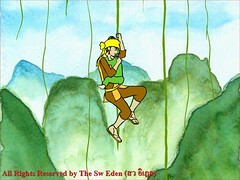 He climbs down the cliff with the vine, and the user will press the right button for him to jump to the next vine when he meets the end of current vine. 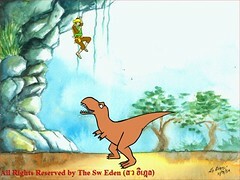 At the bottom of the cliff, there is a baby t-rex tries to bite King Tabin and the baby. At this stage, the Myanmar harp will be added onto the stage, and the user will play it to lull the t-rex to sleep. 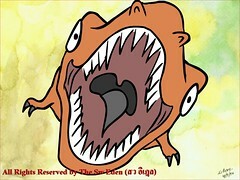 After the t-rex sleep, King Tabin will jump down to the floor and continue walking.